The Twilight Market celebrates the best in local produce and with over 100 stalls packed into one of Belfast’s oldest venues is the perfect appetiser to Northern Ireland’s Year of Food and Drink 2016. Jane Harnett, from Waringstown-based Harnett’s Oils, joins the Lord Mayor of Belfast, Councillor Arder Carson, Steven Millar, Head of Agri-Food Support Services with the Department of Agriculture and Rural Development, and Mark Devlin, head chef with Tedford’s Restaurant. 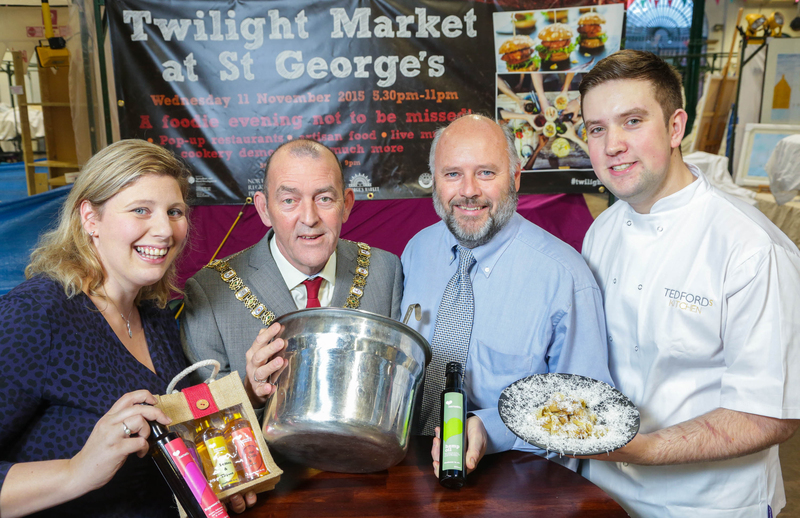 The Lord Mayor of Belfast, Arder Carson, has described Saint George’s Market as “the jewel in Belfast City Council’s crown” and a place to showcase “all that is good about our city’s artisan food offering”. With live music, pop-up restaurants and food and drink stalls to choose from – there is something for everyone to whet their appetite. Throughout the evening there will also be cookery demonstrations – led by familiar faces from the local food scene including chefs from Coppi Restaurant, Mourne Seafood and Belfast Cookery School. This entry was posted in Features and tagged ardar carson, Belfast, belfast cookery school, coppi restaurant, mourne seafood, northern ireland, saint georges market, tedfords, twilight market, year of food and drink 2016 by Michelle Loughran. Bookmark the permalink.